One More For Old Time’s Sake..? I miss big gatherings of people. I miss temporary autonomous zones. I miss people in fabulous costumes, freaky outfits, incredible cosplay, things cobbled together out of other things, paint still wet, gaffer tape, safety pins and face paints. I miss the anticipation of Halloween, the nights getting darker, knowing there was one big Mischief Night in the calendar before Christmas ran rampant through the shops and TV stations. I miss knowing that it was one thing we always did best, the decor, the atmosphere, the only place to be on that one night. I miss loud music, flashing lights, video projections, glow sticks, Panda Pops, sugar rushes, strobes, basslines, mashups, underground music being sellotaped to cheesy pop hits you’d be ashemed to dance to anywhere but among these particular friends, in this particular place, on this particular night. I miss the rains down in Africa, I miss Rickrolling, I miss Haddaway, I miss asking if anyone’s got any salmon, I miss upsetting music purists, I miss laughter ont he dancefloor, hands in the air reaching for the lasers in the smoke. I’m a fan of ending things right. But then who doesn’t love that little bit after the credits? I’m a fan of Once More With Feeling. I’m a fan of listening to what people want and doing something about it. 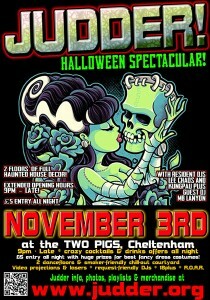 Friday 2nd November at the 2 Pigs, Cheltenham. One night only, going large then going home. Actually, because I’m so worried I’ve forgotten how to do this, I’ll be doing a warm-up set at Montpellier Bandstand this Saturday 11th August, 3-6pm. I’ve missed you. Come and say Hi. And so, we move to our final Judder of the year, and our final Judder EVER. We are lining up some wonderful treats and surprises for our unmissable final event which we will be sharing with you as soon as we have everything confirmed, but here’s what we can tell you right now! - Extended opening hours! Doors open at 9pm, and we’ll keep playing the music until the wee small hours! - Two floors (upstairs from 10.30pm – 3am) with many guests from the history of Judder. - Regular Judder price! £5 entry, £2 off in fancy dress, £1 off before 11pm, £1 off for NUS, combine the offers to get in cheap or free! - Dressing up box – all of my old Judder costumes are coming out to play! If you ever wanted to dress up as a pantomime dame, Hellboy, The Thing, Frankenstein’s Monster, Mikael Gorbachev or many others from the ridiculous past of Judder, now’s your chance! - Loads of giveaways, offers and mementoes! Look forward to seeing you all for a right royal Judder send-off! Only three more Judders left… ever! Hi there Judderers, old and new! So, we have just THREE JUDDERS LEFT until the end of an era, so we thoguht we’d take the time to tell you about them all! 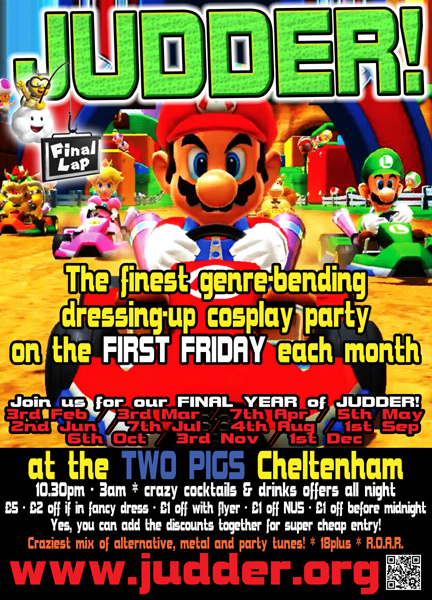 First up, on 6th October, we have our final CHOOSE YOUR OWN THEME JUDDER! – Put your suggestions in now, and we will be collecting them all up for the next week! Then on 3rd November, we have our JUDDER HALLOWEEN SPECTACULAR! – We guarantee this will be the best Halloween event in town, and will be pulling out all the stops to bring you two floors of haunted house decor, tricks and treats, and prizes for the best costumes! We also have extended opening hours from 9pm – late, so don’t miss out on the best party going! 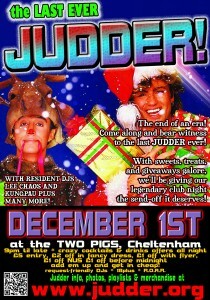 And then, on December 1st, it’s our LAST EVER JUDDER! We are planning to give our legendary club night the send off it deserves and are planning some spectacular guests to help make it a truly legendary night! So put us in your diaries, plan ahead and see you all soon for the end of an era! Change of date & venue for July Judder! OK folks, due to circumstances beyond our control, the 2 Pigs will not be open on Friday 7th July. FOR ONE NIGHT ONLY we have moved July’s Judder to the Frog & Fiddle in the Barn, on the new date of Saturday 8th July from 9pm – 1am. Come to Judder at the Frog, get a hand stamp and then get into the 2 Pigs for free for last orders afterwards! Back to normal for August’s Judder! 2017 will be the last year for Judder. One final lap around the sun will conclude 14 years of genre-beding clubbing that has seen us push the boundaries of what a club night could be. We’ve had hundreds of themes, and seen thousands of incredible costumes in response. We’ve added burlesque dancers, magicians, stilt walkers and fire breathers, filled the venue with smoke, lasers, projections and sweets, and shared the decks with DJs from 65daysofstatic, Pigface, Lab 4, Untraviolence and Nasenbluten as well as leading lights from the UK alternative & industrial scene too numerous to thank individually. 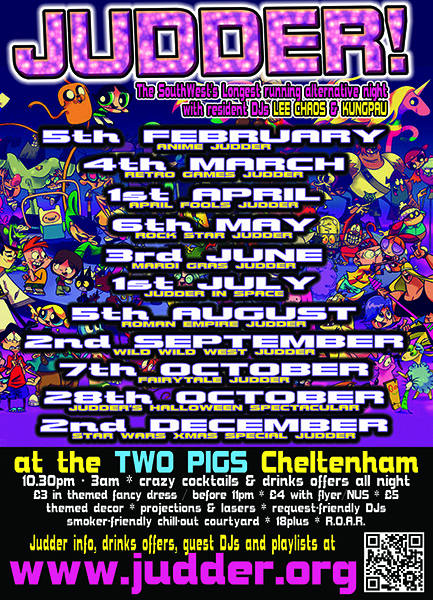 I’ve just counted, and we have run no less than 175 Judder nights to date, not counting takeovers in London, Bristol and Gloucester, or my guest DJ slots all over the world. I’ve personally met and made friends with some talented musicians and enthusiastic music fans who will continue to inspire me and highlight all the brilliant and exciting music that continues to be made to one side of the mainstream. It was never our plan to run Judder for this long, and we were always expecting some young whipper-snappers to take over from us. Whislt we’ve seen night clearly take, er, ‘inspiration’ from Judder, none have managed to capture our unique sense of anything-goes party mayhem, and in particular, the incredible friendly atmosphere of our nights that come from creating a happy little bubble where you can get dressed up or down, and go out & be someone else for a few hours. All of this has been made possible by the people who have come to Judder over the years, had a good time, and sung our praises up and down the land. It’s because you’ve told everyone about our oddball little monthly night that we’ve been able to get away with it for such a long time. But over the years, our regulars have got older, moved away, had kids, adopted unusual and demanding pets, bought homes in need of renovation, and taken on jobs that aren’t compatible with nursing a 2 day hangover. We’ve seen a change in the way people attend clubs in the dozen or so years that we’ve been running Judder, and it can’t have escaped the attention of anyone of drinking age that a lot of late night venues are starting to disappear as clubbing seems to make way for late-night drinking in pubs or staying at home with a few cans and Netflix. And at my age, I entirely understand that – I wasn’t yong when we started Judder and I’m 14 years older now. 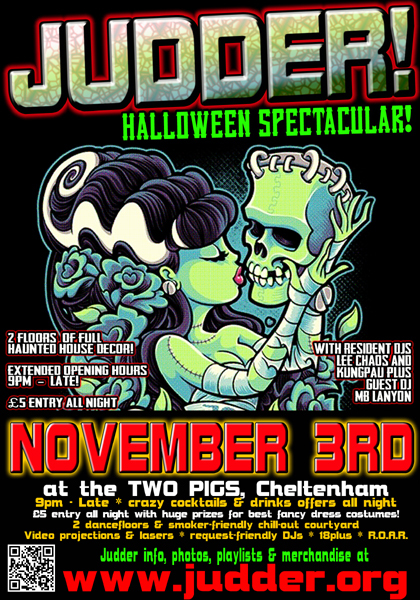 It’s worth saying publicly that we’ve had a brilliant partnership with the 2 Pigs over the years too, and they let us get away with so much in the venue that most other clubs simply wouldn’t allow – it’s been a significant part of what has made Judder feel special, being able to spend days decorating the venue for Halloween, Christmas, or any of our other crazy themes throughout the years. Judder wouldn’t really be Judder anywhere else. There will be many that I expect will be saddened by this news. All I can say is that it would be lovely for you all to come out and make the most of our peculiar anomaly of a night before we get to this time next year, book yourself a babysitter, dog-sitter, komodo-dragon-sitter or whatever for the night, party like you used to in the olden days and remind yourself what Judder was. We’ll be bringing down all of the decor and costumes that we’ve got in storage for you to play with, and let me assure you that it will make for one hell of a dressing-up box! We don’t intend to go gently into that good night, but to add the loudest, happiest, most ridiculous epilogue to the legend of Judder – and we really want everyone who has enjoyed our night to be a part of our last hurrah. See you all in 2017, yeah? Judder’s Halloween Spectacular is on Friday 28th October this year, and as usual we are pulling out all the stops to make this the finest Halloween event in the South-West! - 2 floors of full halloween decor! – Extended opening hours – 9pm – 4am! – Drinks offers all night! – Tricks and treats for early birds! – Generous prizes for the best fancy dress costumes! Entry is just £5 all night, so come on down to the best Halloween party in town! All signs are pointing to our Judder Halloween Extravaganza being super-busy, so this year, to make sure those travelling from far and wide can get in, we are selling advance tickets – book now to avoid disappointment! Our next Judder whisks you away to a magical land for our FAIRYTALE JUDDER! 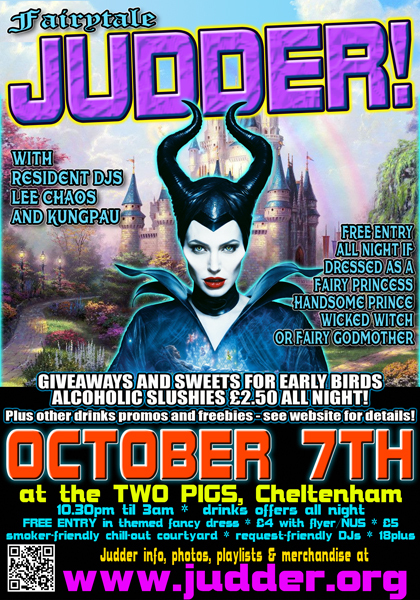 – Free entry all night if dressed as a fairy princess, handsome prince, wicked witch, fairy godmother or any other character from a land far, far away! 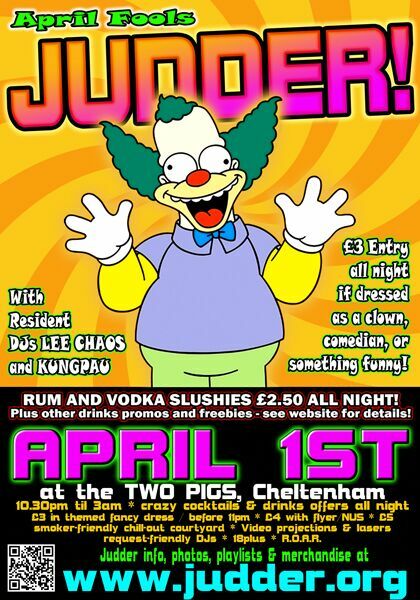 Alco-slushies are £2.50 all night and resident DJs Lee Chaos and KungpAu will be bringing the best tunes in the kingdom – there ain’t no party like a Judder party! For everyone who has asked – our HALLOWEEN JUDDER will be on Friday October 28th this year, and we will be open from 9pm – 4am with two floors of fully decorated Halloween ticks and treats! Put the date in your diary – more news coming soon! 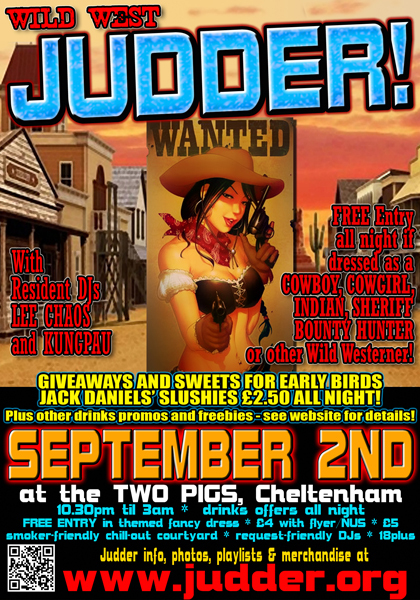 Our next Judder sees us off to the Ol’ Wild West, so dust off your spurs, polish your six-shooter and come on down to the best darn hoedown in the whole of the South West! 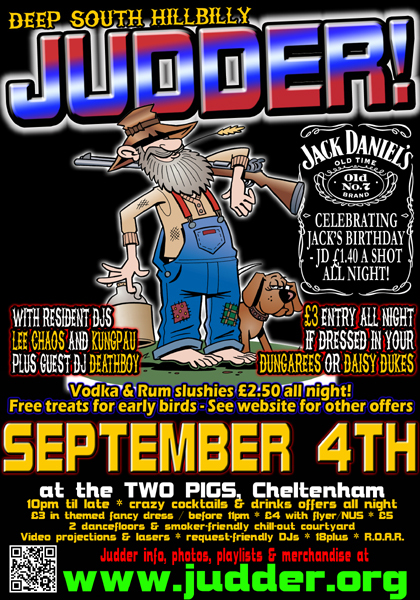 To celebrate Jack Daniels’ birthday, we’ll be serving that ol’ favourite JD Slushies for £2.50 all night, and entry is FREE if dressed as a cowboy, cowgirl, sheriff, rustler or bounty hunter! Round ‘em up and see you there, pardners! Next chance to Judder – August 5th – Roman Empire Judder! Our next chance for mischief is our ROMAN EMPIRE JUDDER! 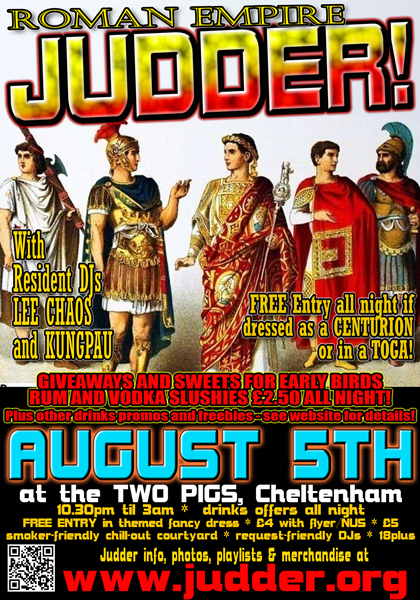 Free entry for anyone wearing a toga or dressed as a Centurion, Gladiator or Lion! 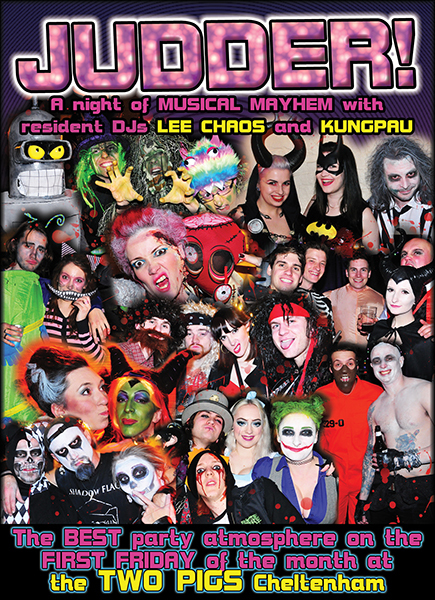 DJs Lee Chaos and KungpAu mash up Rock, Metal, Industrial, EBM, Drum & Bass, garnished with some strong Cheese to make for the finest party in town! 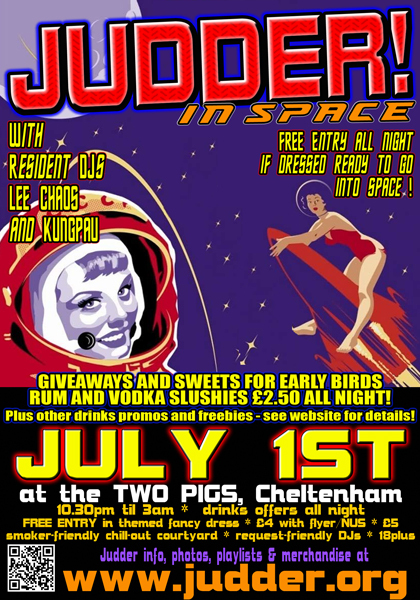 Next chance to Judder – Friday 1st July – Judder In SPACE! After the red-hot sassiness of our Mardi Gras Judder, we’re ready to go out of this world with our next adventure – JUDDER IN SPACE! Get FREE ENTRY if dressed as an astronaut, alien or robot, enjoy boozy slushies for £2.50, play on the retro consoles and rock out to the best metal, alternative and party tunes in town! 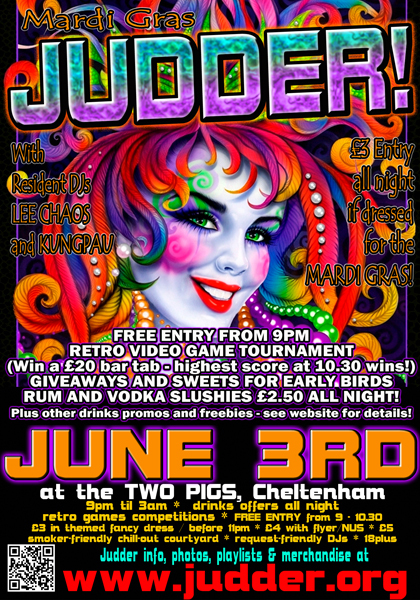 After the party mayhem of our Rock Star Judder last month, we are off to more exotic climates for the summer – on Friday 3rd June come and celebrate at our MARDI GRAS JUDDER! – FREE ENTRY FROM 9PM! 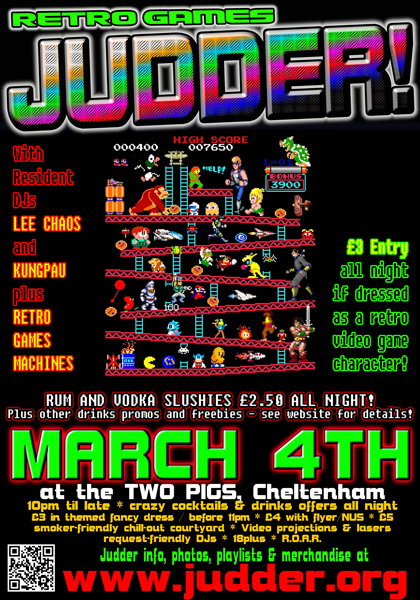 – BIG SCREEN DONKEY KONGA TOURNAMENT – the person with the highest score at 10.30 wins a £20 bar tab! – Plus the usual sweets, treats, drinks deals and resident DJs Lee Chaos & KungpAu tearing up the place with potent cocktail of rock, metal, industrial, electronic and party bangers that make up the unique Judder mix! 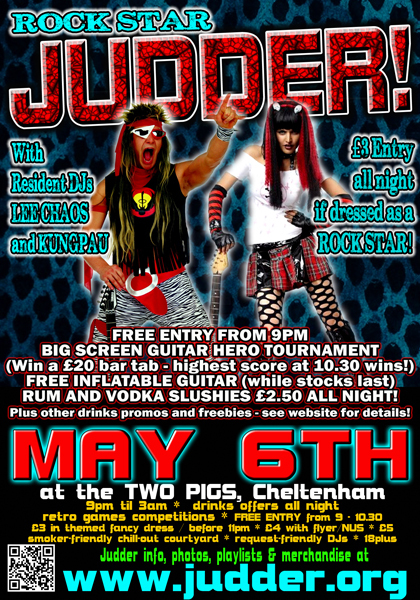 Our next event is our ROCK STAR JUDDER – time to unleash your inner rock god, metal up, get your glam on and rock out! And we’ve decided to shake things up a bit for this one! – FREE INFLATABLES whilst stocks last – free air guitar after! – BIG SCREEN GUITAR HERO TOURNAMENT – the person with the highest score at 10.30 wins a £20 bar tab! – JUDDER’S SQUARE DEAL – 4 people arriving together can get in for a tenner! After a fantastic start to the year with our amazing Anime Judder in February, we are ready for the next event on the calendar – our RETRO GAMES JUDDER on 4th March! 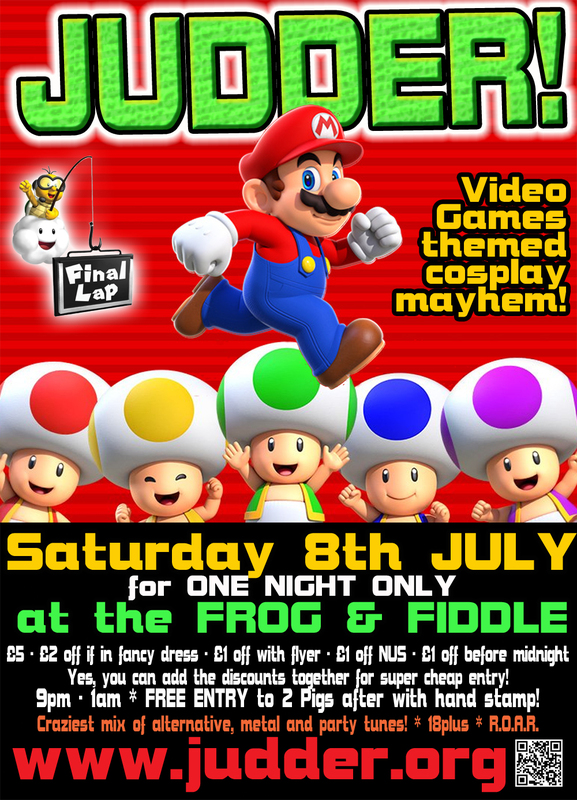 Come as your favourite arcade games character for £3 entry all night, PLUS we’ll be digging out our collection of retro consoles for you to play on! So join resident DJ’s Lee Chaos and KungpAu to Level Up your clubbing experience!! Seasons greetings, Juddering boys and girls! 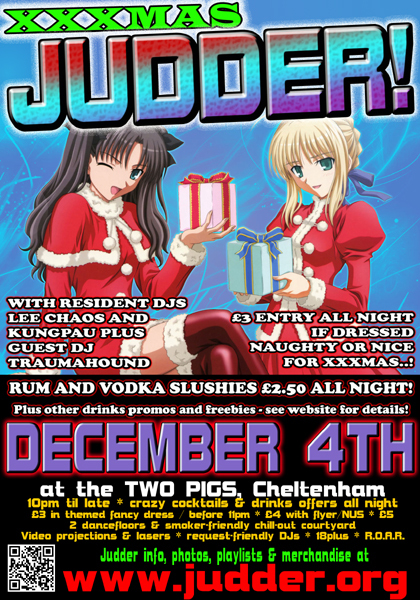 Hope you’re all doing well and gearing up for the festive season whatever way you choose to celebrate (or not) – we had an absolute blast at our last Judder of 2015, with guest DJ Trumahound laying down 2 floor filling sets and the snow machine getting lots of people in the Christmas spirit! There are some great photos on the Judder Facebook so go tag your friends. Thanks to everyone who came out to Judder this year, we’ve had some great nights and we’re looking forward to doing it all again in 2016 – but with a few changes. From February 5th we’ll be making a few changes, uniting the tribes and putting all of the Judder awesome on a single floor with KungpAu and myself tag-teaming in the DJ booth and trying to outdo each other getting people carving up the dancefloor. Here are the dates and themes for next year so be sure to put them in your diary! We’ve got a couple more Christmas presents for you before the end of the year, and we’ve still got to announce the winners from the Halloween costume competition. Merry Christmas and see you next year for a good ol’ Juddering! So here it is, Merry Christmas, everybody’s having fun..! Actually, I’m still finding pools of fake blood and bits of costume from our mind-bendingly awesome JUDDER HALLOWEEN SPECTACULAR! There were so many awesome costumes and the atmosphere was incredible – you never let us down for this one, and once more the bar was raised high with some incredible outfits! We’ve got the official photos up on Facebook now at https://www.facebook.com/lee.chaos/media_set?set=a.10208022168253770.1073741896.1285557006&type=3 – be sure to tag yourself and your friends, as we will be awarding prizes of free entry for Judder next year for the best dressed! We have just one more Judder for the year – our XXXMAS JUDDER on Friday 4th December – we don’t care if you’ve been naughty or nice (even if we do have a preference..!) so dress up in your best party togs and join us, with guest DJ Traumahound, for the best alternative Christmas party in town! We also have a treat for some of you lucky Judderers – if you made it onto the flyer for next year for looking awesome, then you can get into XXXAS JUDDER for FREE! Just point out your face on the new flyer for free entry this Friday! Have a very Merry Christmas and hope to see you on Friday! 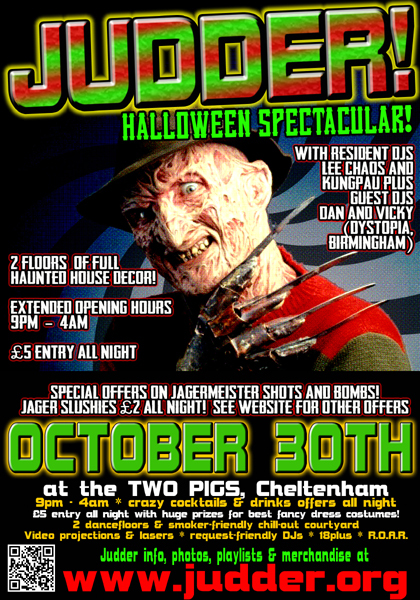 Our next event is the crown jewel in Judder’s calendar – it’s JUDDER’S HALLOWEEN SPECTACULAR on Friday 30th October. 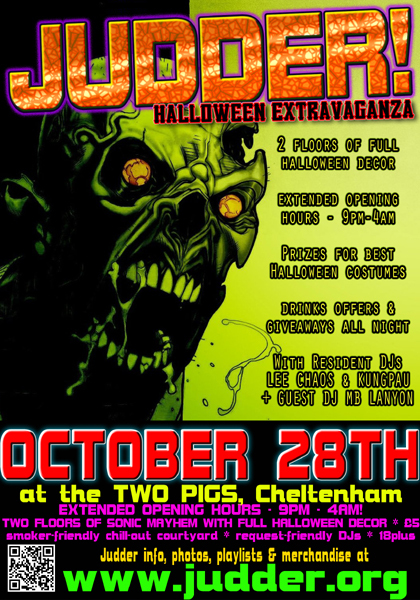 As ever, we’ll be pulling out all the stops to turn the 2 Pigs into a giant haunted house and will be decorating both floors in full halloween decor! I know you lot love dressing up for the spookiest event of the year, and the costumes in the past have been nothing short of spectacular, but as an added incentive, we are giving away FREE ENTRY FOR A YEAR for the best male, female and double-act costumes, so get working on those outfits! We are also opening Judder for 2 extra hours – from 9pm to 4am – to make the most of the best night of the year, so £5 entry gets you SEVEN HOURS of the best alternative party in town! Seriously, there is no better place to celebrate Halloween so come on down for the best party in town! Hope you’re well and enjoying the alternating Indian Summer and cold snaps! We’re still in part mood here, as was evident on Friday at our Hillbilly Hoedown Judder! After our big weddign shenanigans, we’ll admit it wasn’t our busiest Judder but those of you who were there would’ve witnessed Deatboy absolutely tearing the roof off with two incredible sets, Aces High keeping the cheese quotient full, and yours truly filling all the gaps! 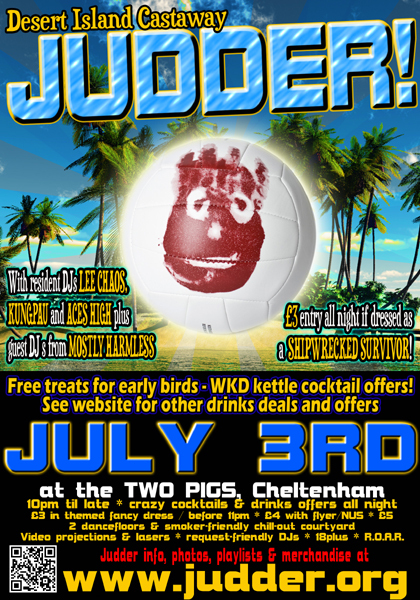 Oh, and those Jack Daniels’ slushies were something a bit special too – get down to the 2 Pigs before the end of the month to take advantage of the special offers on JD! 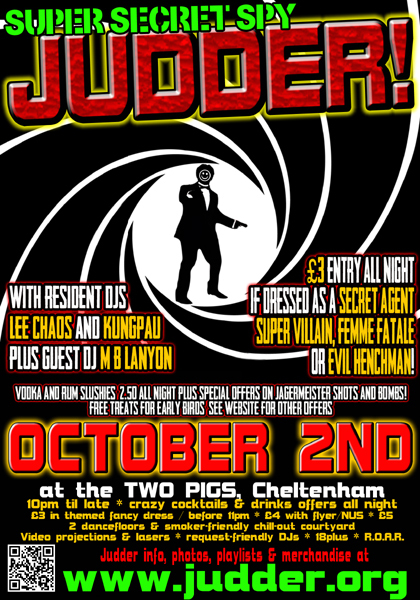 Next month on October 2nd is our SUPER SECRET SPY JUDDER with the welcome return of Guest DJ M B Lanyon laying down wall to wall filth for your listening pleasure. Jagermeister is on offer (we’ll get the details to you as soon as we have them but lord help us if Chip does Jager slushies! ), KungpAu is back downstairs, and entry is just £3 all night for any spies, secret agents, femmes fatale, evil henchmen or super-villains! 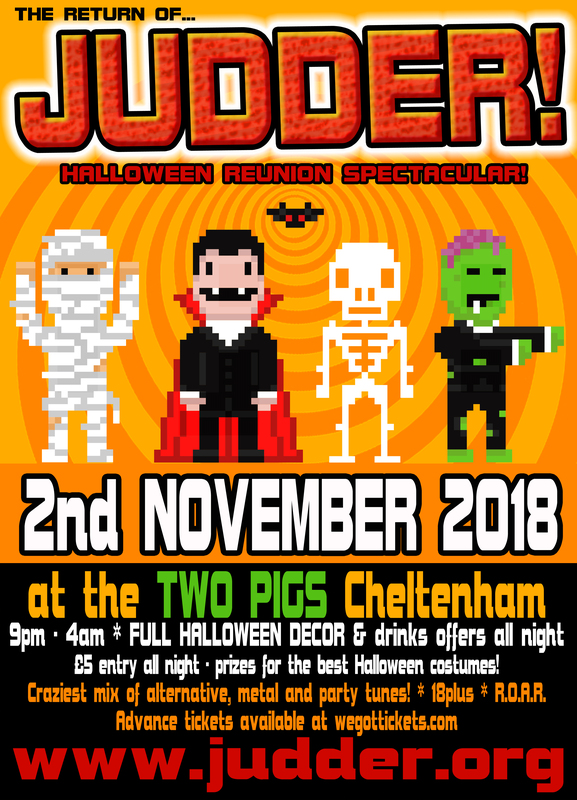 And then we look forward to the crown jewel of the Judder calendar – JUDDER’S HALLOWEEN SPECTACULAR which this year falls on Friday 30th October. Once again, we’ll be decorating the entire venue from top to bottom, we’ll be opening our doors for an extra 2 hours and running from 9pm – 4am, and our guest DJs will be Dan & Vicky from Dystopia in Birmingham. We’ll be sorting out some special offers and there will be extra-special prizes for the best costumes, so come dressed in your most horrible finery and join us for the Halloween party of the year! Right, off to polish my gedgets and get my tux out of storage – see you all on the 2nd! Hope you’re all well and enjoying the intermittent summer! We’re still reeling from the shellshock of JUDDER GOES TO WAR on Friday – it was a fantastic night and something in the air meant that we had a big old crowd of people who were definitely in the mood to party! Just as well, since guest DJ Feygriffin – who drove in all the way from Germany! – played a couple of absolutely blinding guest DJ slots, and KungpAu was on fine form flying solo! There were some great costumes as ever and our official photos will be along soon, but feel free to tak Judder in any of your own! Our next Judder sees us heading to the States for our Deep South Hillbilly Judder! Put on your Daisy Dukes or Dungarees and join us for a a hoedown, Judder style! Our guest DJ for the night is none other than Scott Deathboy, and to celebrate Jack Daniel’s birthday, JD is just £1.40 a shot all night, as well as our now infamous run and vodka slushies for just £2.50 each! Entry is just £3 in themed fancy dress all night some come and join us for some rootin’ tootin’ Southern hospitality! Facebook event is here – sign in! Y’all take care now, y’hear?! Greetings Juddering boys and girls! We hope you are all well and sufficiently recovered from the shipwrecking that was our DESERT ISLAND CASTAWAY JUDDER – many of you braved tropical storms to be with us, and it was always going to be challenging running a Judder the week before the mighty 20 Trees, but those who came out to play certainly had mischief in them, and the Pina Colada slushies seemed to be a HUGE hit with everyone! Big thanks to the MOSTLY HARMLESS crew for joining us on the decks and the dancefloors! Sadly this was the last night at Judder for our downstairs resident Aces High who is off to focus on his Shoot Your Hoops and Grand Theft Audio events. There are a few snaps up on Facebook but keep an eye out for our official photos coming soon! 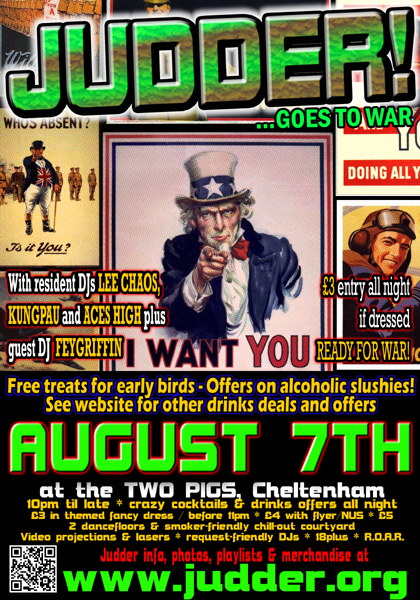 Our next Judder is on Friday 7th August when JUDDER GOES TO WAR! Dig out your combat gear, get ready for inspection and arm yourself for a night of explosive music – or come as a war protester, land girl or refugee! Entry is just £3 all night for anyone in fancy dress. We will be joined by guest DJ Feygriffin upstairs with Lee Chaos, and downstairs DJ KungpAu will be taking all your requests and flying solo. Vodka and rum slushies will be £2.50 all night and there will be more drinks offers so keep an eye on the website! Well, summer is finally here, and we are making the most of it at Judder HQ – the best way to recover after an absolutely storming Judder on Friday night is in the park with a cold cider… And what a night our JURASSIC JUDDER turned out to be! The warm weather certainly seemed to bring out the beast in people, and we had 2 dancefloors packed with dinosaurs, cave women and dino hunters all partying together in perfect harmony! A huge thank-you to guest DJ SGP who stepped in at the 11th hour, then proceeded to rock the house! Whilst it was a shame that DJ Traumahound couldn’t make it, we hope to bring him back before the year is out. And oh my word, those alcoholic slush puppies were a winner, weren’t they?! We are hoping that they become the official drink of Judder, they sure seemed to give everyone the energy to party all throught he night..! Be sure to check out the photos, and look out for more later this month! So, looking forward to our next Judder, we are delighted to bring you our DESERT ISLAND CASTAWAY JUDDER on July 3rd, with a return of Judder stalwart guest DJs from MOSTLY HARMLESS in Norwich! Entry is £3 all night if dressed like you’ve just survived a shipwreck, or have made yourself at home on a tropical island, and we will be announcing special drinks offers very soon! Catch you on the beach! Hey there Juddering boys and girls! I’m still somewhat concussed after an amazing MARVEL Vs DC JUDDER on Friday… and it’s not just the Jagerbombs I swear..! We had a spectacular night with revellers joining us from all over the country, some truly outstanding costumes and banging guest DJ sets from MB Lanyon and Jeffers. Both dancefloors were rammed full of party-goers who did not want the music to end! I guess you all made the most of the at Bank Holiday, right?! 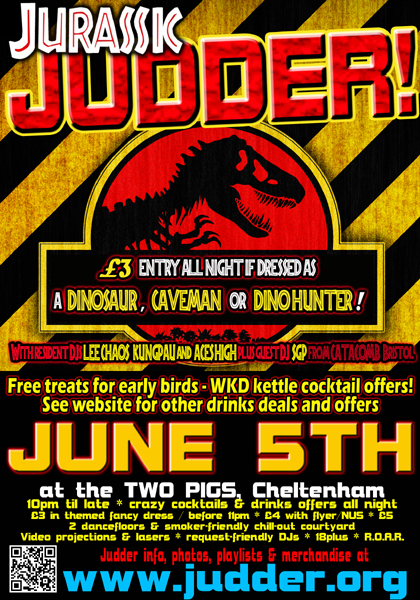 Our next Judder is on Friday 5th June and is our oft-requested JURASSIC JUDDER! Come dressed as a dinosaur, caveman or cavewoman, or dinosaur hunter, and get in for just £3 all night! As ever, there will be treats for early birds and drinks offers aplenty and we are joined by guest DJ SGP from Bristol’s CATACOMB, & the welcome return of resident DJ KungpAu. It’s shaping up to be a monster! See you on 5th June! Hope you all enjoyed a spectacular Easter break! We had a wicked time at Judder HQ, mainy due to our RESURRECTION JUDDER which was just the tonic we needed to chase away the winter blues! More than ever, there were some fantastic costumes as we were joined by the living and the undead to really let rip in the way that only the Judder crowd know how! Big thanks to guest DJ Sintec who got the floor bouncing nice and early for us, and thanks to everyone who came -especially those who came from out of town! Really hope to see you all again soon! 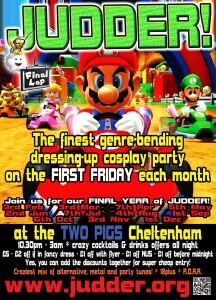 Our next Judder is on Friday 1st May and is our MARVEL Vs DC JUDDER for those of you who like to get your cosplay on! Turn up as any character from the Marvel or DC unioverse and get in for just £3 all night! We have not one but two guest DJs – upstairs I will be joined by a welcome return of M B Lanyon, and downstairs our resident Aces High will be sharing the decks with DJ Jeffers. 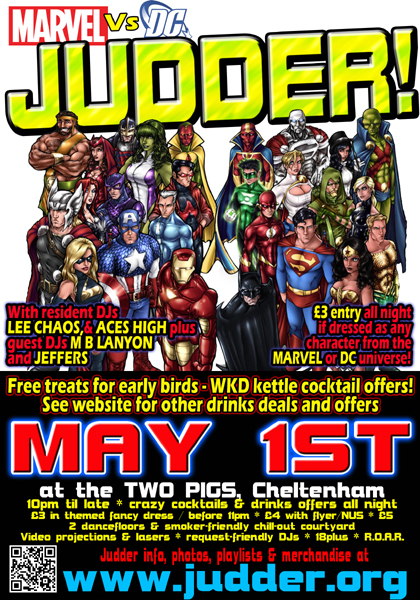 As usual there will be drinks offers all night and treats for early birds, so get down nice and early to show off those super powers! And the best bit is that the following Monday is May Day so you get an extra day to recover! See you on 1st May! 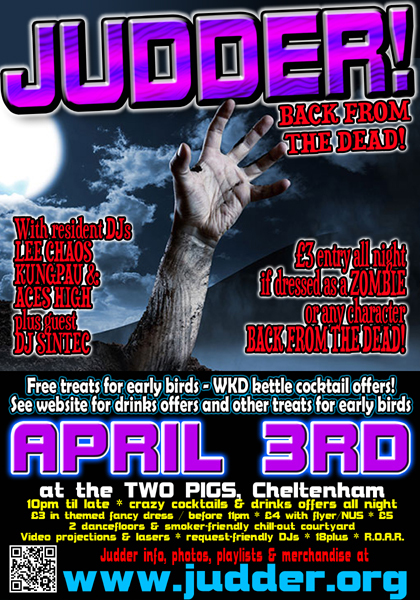 Our next Judder falls on Good Friday, 3rd April and is our BACK FROM THE DEAD JUDDER – come as a zombie or any resurrected celebrity and get in for just £3! Our guest is DJ Sintec who we are delighted to welcome back to the decks after an all-too-long absence, and as ever, there will be treats for early birds and drinks offers all night! Greetings my lovely Judder land-lubbers! Hope you’re all well – we’re still riding the shockwave after our first Judder of the year, our glamorous Valentie’s Prom! We had a splendid, if chilly evening that soon warmed up when people started giving it ther all on the dancefloor! A top guest DJ slot from Kenji Run, and some wonderful effort on the outfits made this the perfect start to the year – thanks to everyone who made the effort to come out, and keep an eye out for the photos coming soon! Our next Judder is on Friday 6th March, and it is time for us to get a bit noautical as we take JUDDER UNDER THE SEA! 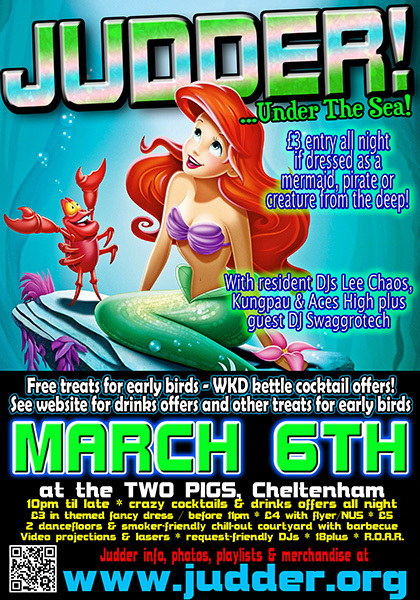 Blow the dust out of your snorkel, splice your mainbrace and prepare for an evening of fishy fun and sea-prises! Our guest DJ for the evening will be the debut outing for DJ SWAGGROTECH and as usual there will be discounted entry of £3 all night for mermaids, drowned pirates, or other creatures from the deep, plus giveaways and drinks offers all night! See you at the bottom of the ocean… everything’s better, down where it’s wetter..!